Background and Objectives: In Uganda, anemia has been a major public health problem; however, between 2001 and 2011, the prevalence of anemia has declined among women of reproductive age (WRA) and children 6–59 months and surpassed the 2016 government targets. 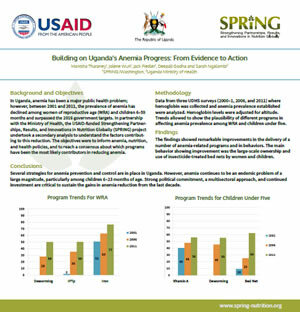 In partnership with the Ministry of Health, the USAID-funded Strengthening Partnerships, Results, and Innovations in Nutrition Globally (SPRING) project undertook a secondary analysis to understand the factors contributing to this reduction. The objectives were to inform anemia, nutrition, and health policies, and to reach a consensus about which programs have been the most likely contributors in reducing anemia. Methodology: Data from three UDHS surveys (2000–1, 2006, and 2011) where hemoglobin was collected and anemia prevalence established were analyzed. Hemoglobin levels were adjusted for altitude. Trends allowed to show the plausibility of different programs in affecting anemia prevalence among WRA and children under five. Findings: The findings showed remarkable improvements in the delivery of a number of anemia-related programs and in behaviors. The main behavior showing improvement was the large-scale ownership and use of insecticide-treated bed nets by women and children. Conclusions: Several strategies for anemia prevention and control are in place in Uganda. However, anemia continues to be an endemic problem of a large magnitude, particularly among children 6–23 months of age. Strong political commitment, a multisectoral approach, and continued investment are critical to sustain the gains in anemia reduction from the last decade.